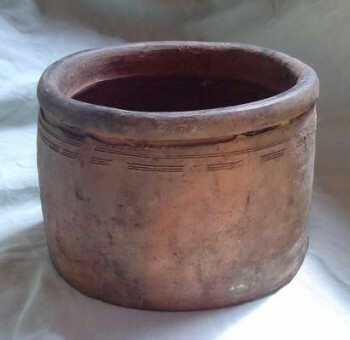 Stoneware container, Kinh ethnic minority group, Vietnam, 17th C., 5.25" x 7.5". Description We carry several of these containers that were recently excavated in Vietnam and dates from the 16th -17th century. Their rough look might suggest that they were made for local lay use, but the opposite is true. There is evidence that these stoneware container were exported to Japan where they were very admired for their "wabi-sabi" quality (that is, their natural, rough, unrefined quality). The Japanese so valued these that they gave them the name of Nawasudare ware, and used them in their tea ceremony. Nawasudare meands "rope curtain" and this attribution is probably due to the linear markings combed on the sides of these containers. We carry several of different shape and varying slightly in size. This one is 5.25 inches high and 7.5 inches wide.